Chanel is my early Christmas present and she is a Pullip. 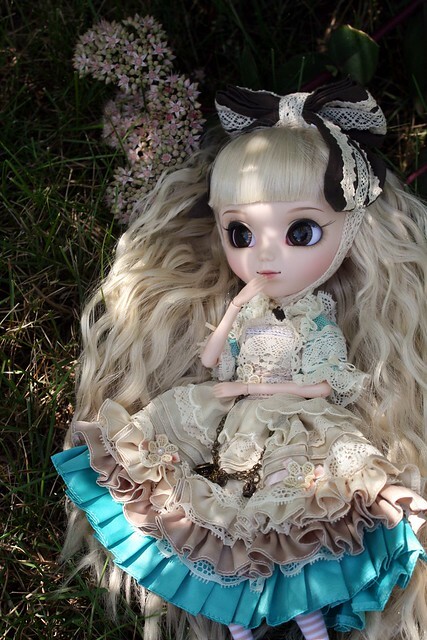 Pullips are wonderful dolls with tiny jointed bodies. Most owners tend to swap out the original body for an obitsu one. This trend is also prevalent in Blythe owners who swap out the original for a pure Neemo body. Because I just plan on having one Blythe and one Pullip, I’ll be keeping the original bodies. I am very tempted to make Victorian style cases for both of them but that requires my studio in the basement to be done. I want to display both beautiful girls in custom niches. It’s basically transforming a wooden box with a latch into a little dollhouse/niche. It’ll be a DIY project I want to do in the future- perhaps when I take time off near Christmas? Anyway, Chanel will be my model for my Last Unicorn Project. I will be sculpting hooves and a unicorn horn. Her outfit will be in lavender. I’m going to start her outfit as soon as tonight. I think I’ll need to make an elaborate skirt which is short in front and long in the back to show off her hooves. I need to recheck my fabric because I am certain I have lavender silk dupioni for the over dress and froths of cream fabric for the underdress. This dress will definitely include embroidery and beading. On the embroidery front, I also have Dorothy’s hoop waiting to get appliqued. I’ve re-tweaked the design to showcase the colourful characters of The Wizard of Oz. I hope to work on it intermittently while I’m getting my Last Unicorn Project underway. I still have to go to my framer and get Little Mermaid, Rococo Cinderella, Little Red, and Swan Girl framed for the County Fair. This summer, I feel like my creativity/energy/motivation is diminished. The volatile weather has turned me into a crippled zombie. I suffer from weather-triggered migraines and this summer has been exceptionally dismal. Every day is a battle and a challenge to get things done. I consider it a good day when chores get done. Since I don’t know how I’ll feel at any given day, I set little tasks and allot more time to get things done. Most of my creative time is spent at night after the little one is in bed and sometimes if I’m lucky when Natalie naps. However, in most cases, I feel so sick I need to nap when Natalie naps just so I have the energy to run after her. Fall is almost here and my migraines are fairly gone in the winter. I’m a perky bunny in the winter time while my husband who enjoys his sunshine, turns into a SAD zombie. Natalie looks like she’s taking after her father because her favourite place is “Owww-shied” (outside). What ever will I do when winter blizzards snows us in? You are currently reading The Last Unicorn Project at Sushi Candy.